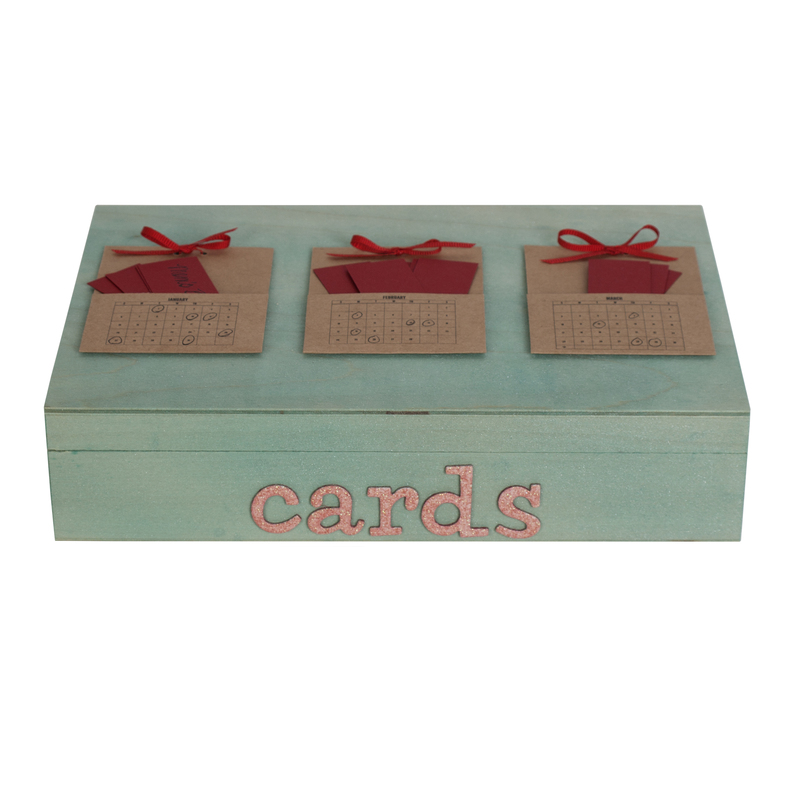 I wanted a place to keep cards, as I made them, for various special occasions. I found monthly calendar pockets from Studio Calico that could be added to a storage box to remind me each month that there was a card ready inside to send or give with a gift. 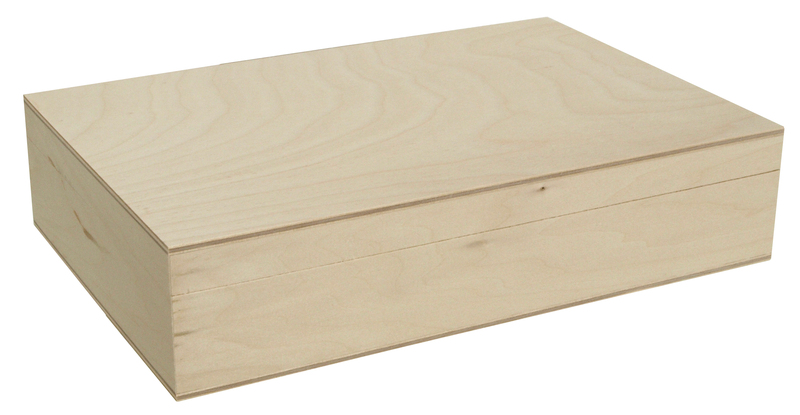 I started my project with the Keepsake Box (http://www.walnuthollow.com/store/wood-surfaces/boxes/), however there are several other boxes that would work as well. 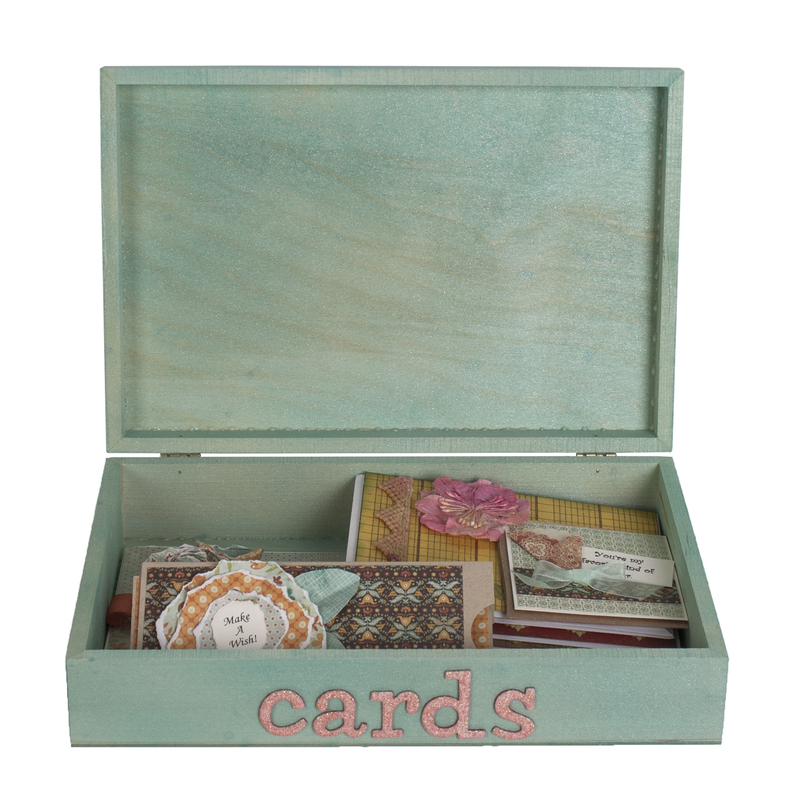 I like this box because it has enough room to hold several cards and any size card that I want to make. As we’ve talked about before, I love using Tattered Angels® Glimmer Mist colors (http://mytatteredangels.com/products/). You can choose whatever you like – I chose Bahama Blue. Simply mist the entire box with the Glimmer Mist you prefer. Once the box is dry, use Tombow® MONO Aqua Glue (http://tombowusa.com/craft/mono-multi-liquid-glue.html) to adhere the calendar pockets that have a small bow tied at the top onto the top of the box. As I placed a card into the box, I wrote the name of the person it was for on a piece of paper and slipped it into the appropriate monthly pocket. I circled the date on the pocket also. Add color to the Glitter Sticker Chipboard Letters from American Crafts™ by just brushing Tattered Angels Glimmer Glaze – I used Paradise Pink – onto each letter. Wipe off the excess with a paper towel. The letters have a dot design resist making them more fun than just plain letters.The brush comes right inside the small Glimmer Glaze bottle, like fingernail polish, so it’s very easy to use. The letters are stickers so just add them where you like once they are dry. Add cards to the box as you make them – and don’t forget to circle the date on the pocket to help you remember to send them! 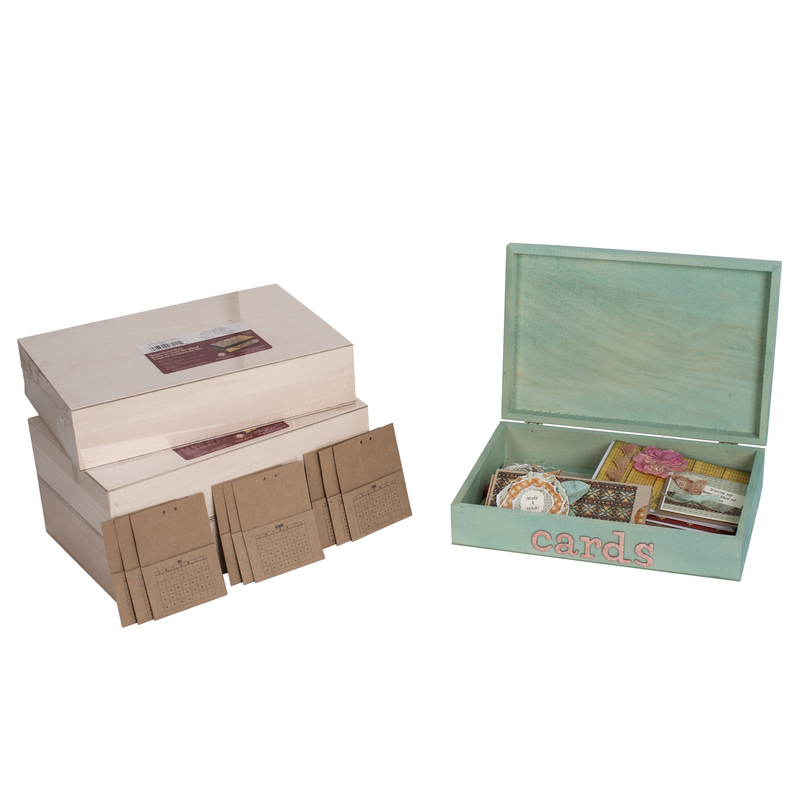 I wanted to organize my cards for the entire year – or at least have a place to put them when I made them for birthdays, anniversaries, weddings, etc. I needed four boxes for the whole year – each for the celebrations and happenings for three months. Now onto organizing other areas……….where to start?!! !